The Norwegian tradition for farmhouse brewing has survived particularly on the west coast and in the middle part of Norway. 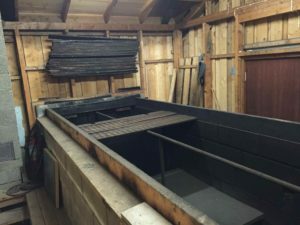 In Stjørdal they still malt their own barley in specially built traditional malting houses on the farms called “Såinnhus”. They use direct fire with alderwood to dry the malt. 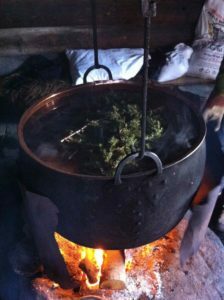 Some of them also use a juniper infusion, called Einelåg, made from juniper branches as brewing water. Their traditional yeast is unfortunately gone so they use bakers yeast or yeast from the local lager brewery. In Hornindal, Voss, Sogn and Møre on the west coast of Norway though they still keep their farmhouse yeast which they call Kveik. How old some of these strains are and how many generations they go back we are not sure of. We are also unsure of their origins, only that they are not of modern and laboratory pedigree. These yeast are traditionally pitched at close to 40 C which sounds insane to a modern brewer, but produces some interesting flavours in the beer. Beer made with one strain I had made an orange liqueur flavour that I have never gotten from any modern yeast strain. Many of these brewers make raw beer (not boiled), with makes for a different malt flavour and mouth feel. If one looks at what these Norwegian farmers have been doing through generations it in respect to the modern way of producing food and beverage products most of it doesn´t make sense. But if one tries to think like a farmer would it suddenly makes perfect sense. Take the fermentation temperature as an example. What is the most exact temperature one can measure without a thermometer that is closest to a good fermentation temp? Body temperature of course, and there anthropological surveys made in the fifties where the farmers were asked at what temperature they added the Kveik. An answer that pops up quite frequently is “milk warm”, a reference a farmer would know like the back of his hand. For more information, check out Amund’s full article. 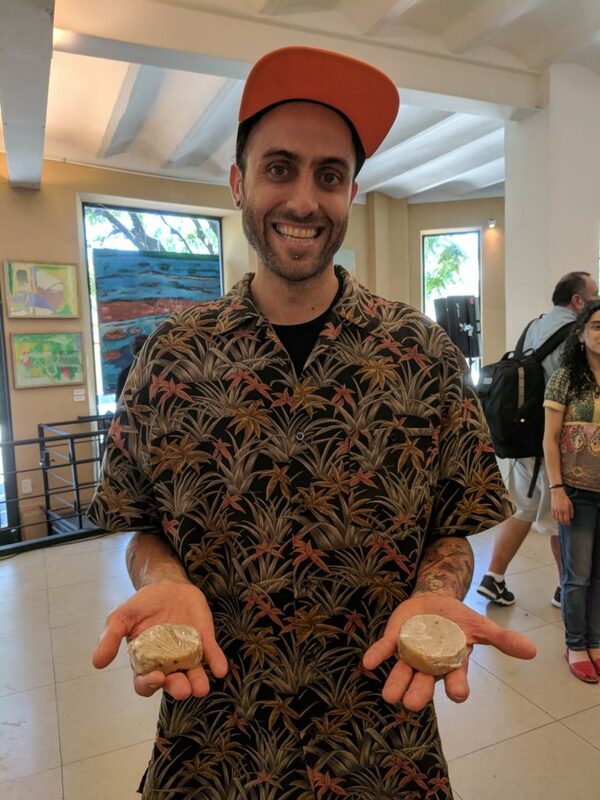 This week, teaching in Buenos Aires, Argentina, I tasted the best, cheesiest vegan cheese I have ever encountered. It was made by one of the students in my workshop, Nico Salguero. He generously explained his process to me in some detail. Soak almonds in water for about 24 hours. Sprout the soaked almonds for about 2 days, rinsing periodically to keep them moist, but draining so they have access to air. Grind almonds with fermented coconut milk yogurt or kefir, just enough to grind it into a thick paste. As an alternative he suggests rejuvelac of alfalfa. Ferment for 24 hours at about 25°C/77°F. Dehydrate for about four days at a low temperature, about 20°C/68°F. The idea is to form a dry crust so it is easy to handle for the next steps, while the cheese retains moisture inside so fermentation can continue. Submerge cheese in seawater or brine. Beginning on the fourth day of dehydration, and continuing for three days longer, submerge the cheese in brine three times each day. This is exactly how many aged dairy cheeses are salted. If you’re mixing a brine. mix it at about 5%, or 50 grams of salt for a liter of water. After the salting, dehydrate about 5 more days at a low temperature, about 10°C/50°F. 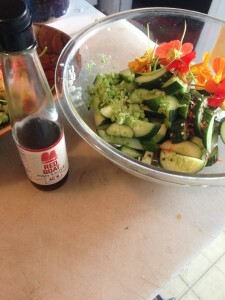 If you don’t have a dehydrator that can do this, the refrigerator will work. Age cheese for 3-6 months at cool ambient temperatures. 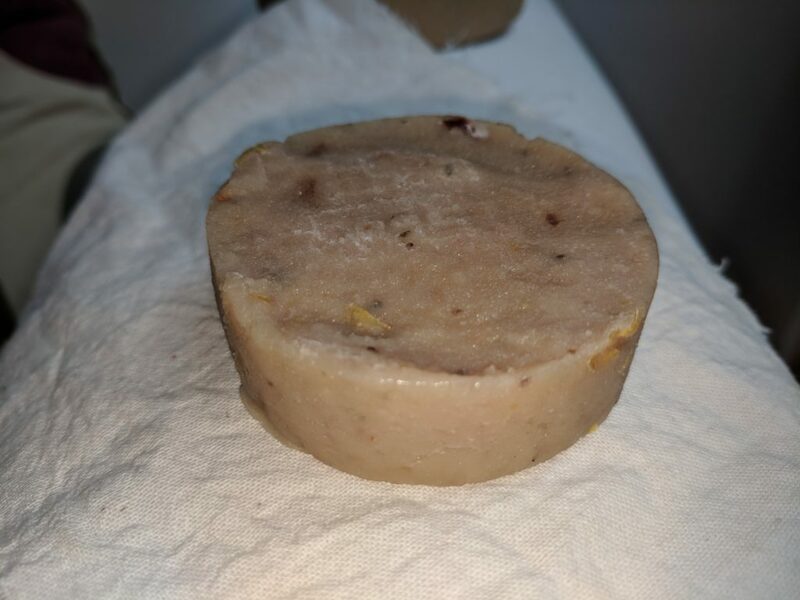 According to Nico, it is possible to make this as a blue cheese by using a pin to insert blue cheese molds into the interior of the cheese after the initial dehydration. I traveled to China in November-December 2016 in order to learn about fermentation practices there. I travelled there with my friend Mara King, her mother Judy, and another friend, Mattia Sacco Botto, who documented our travels on video. 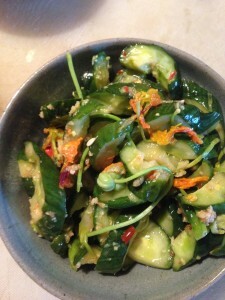 They all speak Mandarin and English, and share my fermentation and broader food interests. These eight videos, made by Mattia Sacco Botto, document some of what we saw and learned on our journey. Sandor Katz has been enchanted by fermentation, the mysterious process by which microbes transform food and drink, for some two decades. Since making his first crock of sauerkraut, his fascination withfermentation has broadened, deepened, and he now travels the world giving workshops. Based in Tennessee, his books including ‘Wild Fermentation’ and the encyclopaedic ‘The Art of Fermentation’ have helped many thousands of people to get started with making their own ferments, experimenting with flavours, fruits, vegetables, spices… and microorganisms. Dan Saladino travels to Sandor’s forest home in rural Tennessee to meet Sandor, hear his story, and discover for himself the transformative, delicious potential of these mostly simple culinary processes. Coming up in a future edition of The Food Programme, a practical masterclass in fermentation with Sandor Katz. Masaru-san described to me a simple ancient method of making saké, which he called Bodai-Moto-Zukuri that sounded so simple I had to try it as soon as I got home. I’m very pleased with the results! 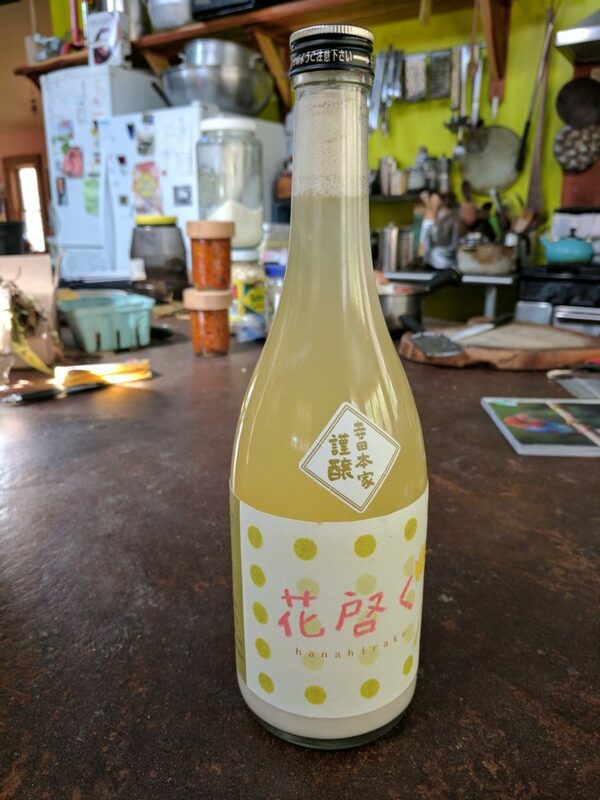 Saké brewed at home in two weeks without any special equipment. In a bottle from Terada Honke Brewery, where i was told about this method, Bodai Moto-Zukuri. The only ingredients are rice and water. I used 1.5 kg/3 lbs of rice altogether to make about 3 liters/quarts of saké. Some of the rice is in the form of koji, molded rice; see Art of Fermentation for info on making koji, or buy it. The whole process took about 2 weeks. The only equipment you need is a vessel with a capacity of at least 6 liters/1.5 gallons, and two cloth or mesh bags with mesh fine enough to hold rice. Steam 500 g/1 lb rice. Fill mesh bags: Transfer the steamed rice to a mesh bag, and place 500 g raw rice in the other bag. Submerge: Fill vessel with 2 liters dechlorinated water and submerge the two bags of rice. The cooked rice will decompose into the water, providing nutrients for the yeast and bacteria on the raw rice. Gently massage bag of cooked rice for a few minutes each day. Taste after a few days. It’s time for the next step when it’s bubbly and starts to taste a little sour. For me this took four days. Remove bags of rice from the water, and retain liquid that drains from them. Steam the soaked raw rice. Cool until still warm but comfortable to the touch. Mix warm rice with 500g/1 lb koji, as well as the original cooked rice that has been soaking. Mix the three different forms of rice together thoroughly. Return rice to water in vessel. Ferment 10 days to 2 weeks, tasting periodically. Traditional German Christmas Cookies used to be made with fermented Lager Dough which was prepared around August and left to ferment until baking time in November / December. This is a mostly forgotten art. This is very simple to make, with delicious results: Cookies with a very subtle, fine texture. In August/September/October you prepare the basic dough without any spices/ dried fruit/nuts/leavening, which are all added later, when you bake the fermented gingerbread. Traditionally, this kind of luxurious gingerbread cookie is baked on wafers. I use round wafers with a diameter of 70mm and I baked 530 gingerbread “Ellisen-Lebkuchen” this year – as they make a Christmas present you can’t easily buy, with an exquisite taste. As I assume you want to start with a small quantity the first time, I’ll give you a small recipe. That is all, if you want to rely on wild fermentation, which is the ‘old way’ to do it – that is to rely on the fungi, yeasts and bacteria from the organic flour and the organic blossom honey and to a lesser extent of the beetroot-syrup“ (Zuckerrübensirup) I use. Once you have mixed the three components to form a dough, you put the lid on the pot and leave it to ferment in a cool spot for a few months. Once November or December have come, you might want to bake your gingerbread cookies. I take a portion from the dough, put it in a large baking bowl and place the bowl on a water filled pot on my stove for a few hours to get slightly warm so that I can knead in the things I want to knead in. −	ground or chopped almonds, cashew nuts, walnuts etc. Once you have mixed your dough with these goodies the next step is to add 2 leavenings. In Germany we use 2 tablespoons of “Hirschhornsalz” (hartshornsalt, ammonium carbonate) dissolved in a little lukewarm milk, stir that into the dough, followed by 2 teaspoons of potash (potassium carbonate), also dissolved in lukewarm milk and stirred in. If these are not available, use 2 tablespoons of baking powder and 2 teaspoons of baking soda. Add a little more water or – more likely – some organic flour to get the dough to a consistency that enables you to form little balls of dough with a teaspoon and your hand which you then put on a wafer on a baking tray and press it to form a pancake shape. The cookie will rise a bit perhaps by 100% in height and a bit less in width. You’ll find out the right amount of dough for each wafer soon. About the amount of the size of a walnut? Bake at 180°C/350°F on the lowest shelf for 15 to 18 minutes. Don’t bake your gingerbread too dark – just nice and brown. Cool on a rack with good air circulation. Then, the next day, you can proceed if you wish and add the icing / chocolate coating. My favourite is a gingercake with lots of candied orange and lemon peel, candied ginger, walnuts, sliced dates, cashewnuts, chopped chocolate, covered in a chocolate coating of molten chocolate which we call “couverture” with a French word. In a mixing bowl mix the lemon juice, raspberry juice and dried red rose petals. 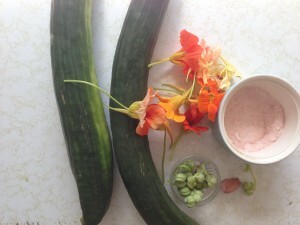 Use an immersion blender to cut the petals into very fine pieces in the juice, which can take about 3 to 4 minutes. Add the powdered sugar until you get a thick icing which you can use to “paint” your cookies. The raspberry juice makes the mixture a pastel pink, in which the darker red rose petal pieces give you nice red dots – and the lemon juice the much needed zing. If they should get a bit hard, put half a small fresh apple into the container, which will give them some moisture back. 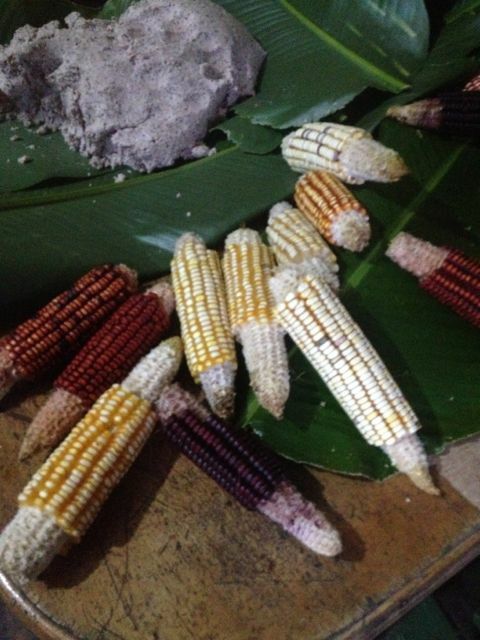 A highlight of my recent visit to Costa Rica was seeing first-hand how the indigenous Bribri people there prepare a molded corn starter for making chicha, a corn-based alcoholic beverage. Chicha is most famously prepared in the Andes mountains of South America by chewing corn in order for the corn to become saturated with salivary amylase enzymes, which break down starches into simple sugars fermentable into alcohol. I have made chicha in this way and published information on how to do this in my books Wild Fermentation and The Art of Fermentation. I had heard from travelers to the Andes that much of the chicha available there today is produced not by chewing corn but instead by malting (sprouting or germinating) corn, as barley-based beer is made. Germination also produces enzymes that break down starches into simple fermentable sugars. Then, a few months ago, when I first met Costa Rican environmental and seed activist Fabian Pacheco, he told me about this chicha made using a molded starter. Fabian brought me to Finca Loroco, a diversified organic farm and educational center, run by his Bribri friends. The oko was already in process, being made by Mauricia Vargas, the mother of the family, Solar Trailer in keeping with tradition around the world in which women have been the brewers. As Mauricia explained it to me, dried kernals of (starchy) corn had been soaked in water for three days. Just before our arrival, the soaked (and thus already fermenting) corn was ground into a thick paste, like a masa dough for tortillas or tamales. We participated in the next step, placing handfuls of this dough into large leaves of a plant they called bijawa (genus Calathea). 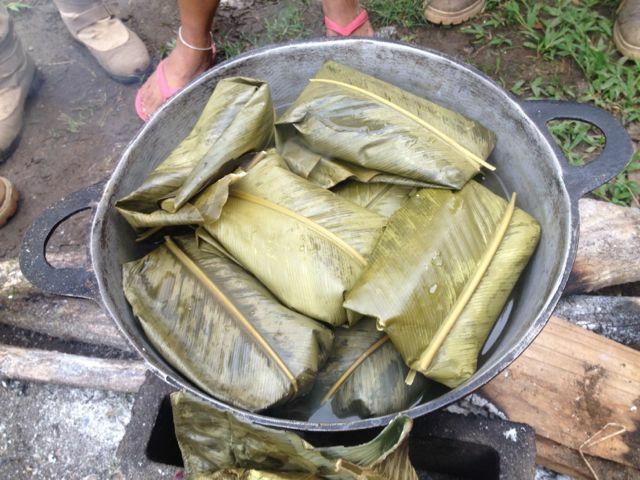 Each mass of dough was wrapped like a tamale, except in two leaves. 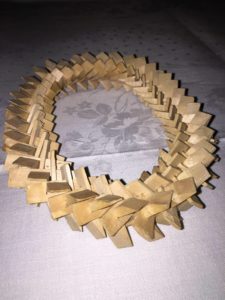 The technique was to fold the stacked leaves in half, in order to break their spines in the middle, then form the mass of dough into a rectangular shape on the stacked leaves, roughly 6 inches/15 cm high by 3 inches/7.5 cm wide and ½ inch/1 cm deep. (I did not measure, these are my estimates, and the masses varied quite a bit in size.) The important thing is that the mass be small enough to fold the leaves around them and completely enclose them. 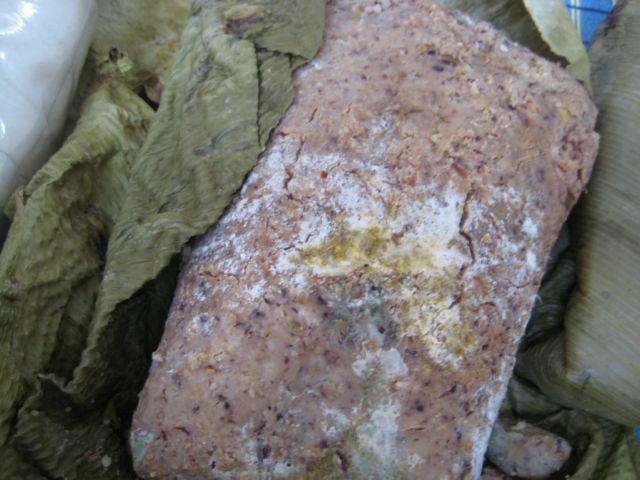 Dough made by grinding soaked corn, bijawa leaves for wrapping it, and cooked, wrapped corn masses. 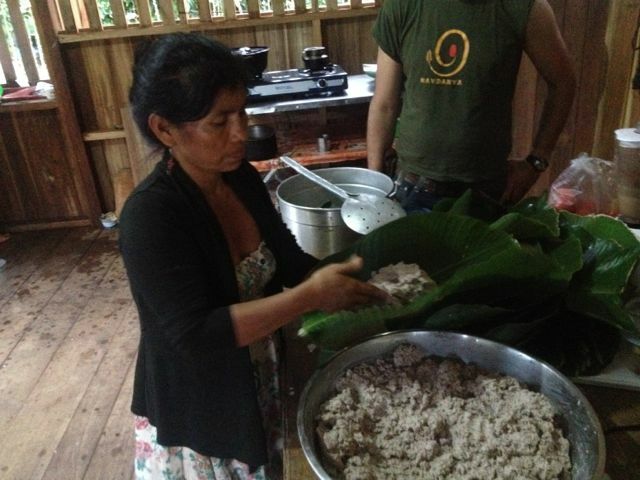 Mauricia Vargas wrapping corn dough in bijawa leaves for making oko. The corn dough wrapped in leaves were then cooked in a big pot, most of them covered with water, but the ones at the top steamed rather than boiled. They were cooked for about an hour, then removed from the pot, and left to spontaneously ferment and mold. We did not stay for the entire fermentation period, but as Mauricia explained it to us, the wrapped corn is left undisturbed for four days. On the fifth day, the leaves are opened and the corn masses are removed. Then the leaves are turned over and the corn masses are rewrapped, with what had been the outer surfaces of the leaves in contact with the corn mass. This brings different leaf surfaces into contact with the corn mass, exposes everything to air (molds need oxygen), and seems to help to evenly distribute mold formation. After four more days, the mass is partially dried in the sun, then rewrapped, again flipping the leaves to vary surface contact. Finally, after four more days, the moldy masses are dried in the sun and ready to use or store until use. Wrapped corn masses cooking on the fire. Mauricia Vargas and her family, along with Fabian Pacheco, my wonderful host in Costa Rica who took me to meet them. I participated in the initial wrapping stage only and was sent off with a couple of the wrapped corn masses to age as they described. When I first examined the corn masses after four days, mold growth was patchy. By color and by smell, I could recognize some of the mold as Aspergillus mold like those I have grown many times on rice and barley to make koji. But it showed green mold as well, indicating more than a single type of mold. Four days later, mold covered most, but still not all the surface. Some of the molds were long and hairy and clearly were sporulating. 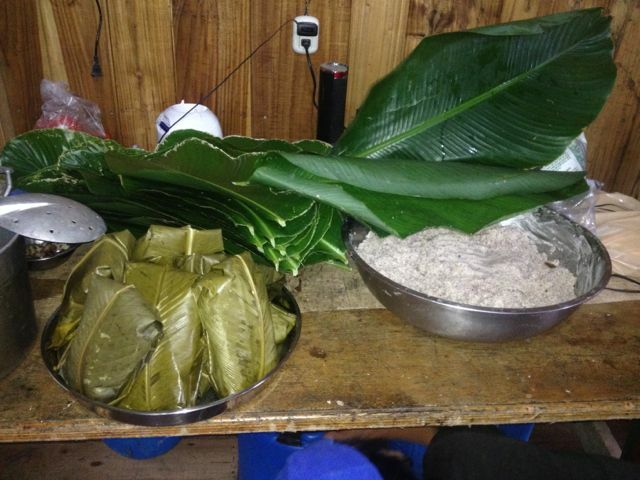 I did not remain in Costa Rica long enough to complete the process or make chicha with the oko, nor did I dare try to bring it home with me, to complete the process or send it to a lab for analysis. Molds growth after four days. Mold growth after nine days. 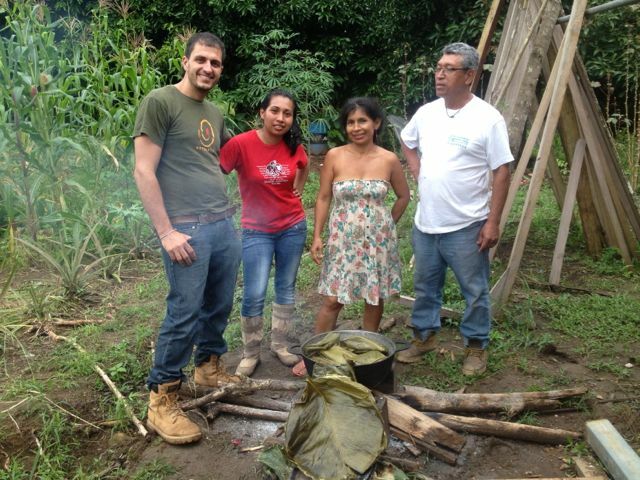 Even in this one family, there are many ways of making chicha. Most are made without the moldy oko starter. We had delicious (and strong) chicha made by removing the steamed and cooled corn masses from the leaves (without the molding process), mixing them together into a paste in a bucket, allowing this paste to ferment in a solid state for several days, then adding water and sugar and allowing the liquid to ferment for a few more days. We were also served a chicha made by adding steamed bananas to the corn paste, allowing that to ferment in a solid state, then mixing that with water immediately prior to serving. They also described chicha made with cacao and corn. Clearly chicha is not a single uniform product but rather a range of corn-based beverages, some only mildly alcoholic, others stronger. 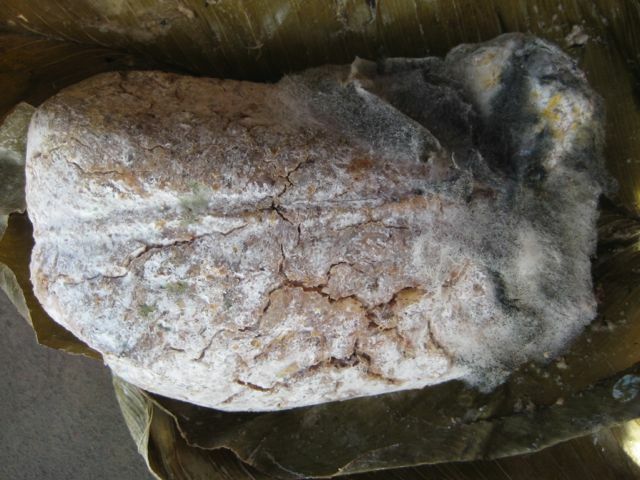 The chichas prepared without the moldy oko require sugar or bananas for fermentable simple sugars; the oko is necessary only for chicha made from just corn and water, so that the amylase enzymes from the molds can break down the starchy corn into fermentable sugars. Due to the fact that I was not there long enough to see the process in its entirety, along with the limitations of our communications and translation, this is certainly not a comprehensive or definitive account. But because nothing (that I have come across in the English language literature) has been written about this, and because of its apparent uniqueness in the Western hemisphere, I thought it was important to share this information, incomplete as it may be. Was this practice the result of an accidental discovery, as so many fermentation processes are, with similar molds developing on grains here as across Asia? Or was there perhaps some past Asian influence here, long forgotten? The origins of fermentation practices are always shrouded in mystery. But over and over we see patterns repeated, with microbial phenomenon manifesting similarly (and at the same time uniquely) in disparate locations. Molded grains for alcohol in Central America is very exciting.